Hello ITM readers. It has been a while since I've posted here! So, yeah, this is basically a chance for me as a medievalist to chime in and say something about this whole Richard III thing before the "moment" passes. 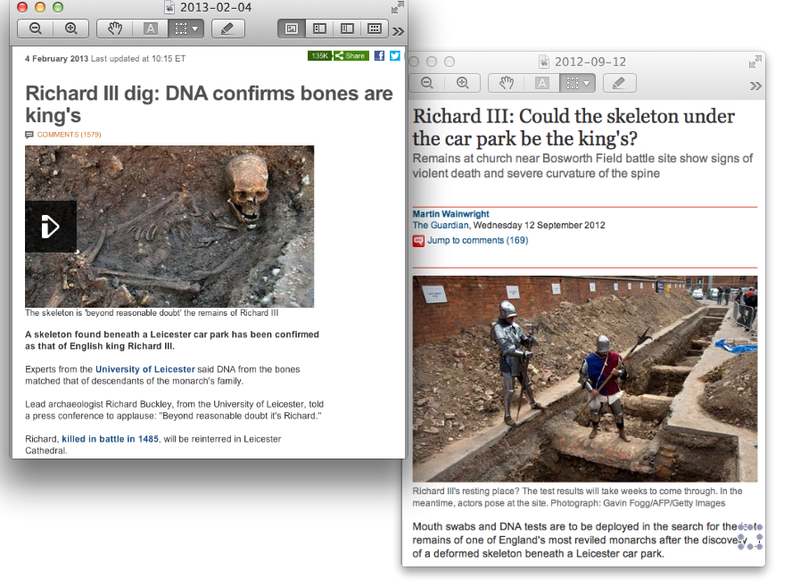 Unless you've been hiding in a cave / under a rock / whatever these days, you've probably heard of the unearthing of what appears to be the DNA-confirmed body of the medieval English monarch Richard III (see HERE); this king is most commonly imagined (via Shakespeare and other sources) as an immoral, scheming villain with a hunchback. The curved spine of the body -- discovered buried underneath a car park (parking lot) -- seems to confirm the identification. Recently I've been thinking a lot about how notions of temporality (especially as developed in premodern literary studies) can further engage with conversations in disability studies, and I'd actually like to take "this Richard III moment" to think not so much about the king himself but a little something I'd like to call "distemporality." In this image above (with many similar ones online and in other media), we see a partially staged photo op: historical reenactors in "medieval" armor look on as the car park excavation begins. As far as I know this term hasn't really entered the critical lexicon in any coherent way (this term pops up in scholarship only idiosyncratically, in a rather ad hoc fashion), but I would say that a certain "distemporality" characterizes these types of cultural moments quite well. In a different context, Rebecca Schneider (discussing historian reenactments of Vietnam War art) identifies certain forms of reenactment as "[m]oments of dis-temporality, of uncanniness, of error, or of a return to sense occur in pauses ... or tiny details of interruptive anachronisms as the 'now' folds and multiplies -- even for [Howard] Zinn's 'brief flash'" (186). This quotidian "snapshot" above -- a flashpoint humorously depicting a "culture clash" between everyday modern life and re-created nostalgia-inflused past -- visually conveys the distemporality effected by the entire "event" of Richard III's disinterment. Distemporality, as I am thinking through the idea, is not just about temporal disruption per se: I'd like to use this concept to rethink everyday assumptions about how we move through time itself. If we more deeply unpack a notion of distemporality, we could say this involves attending more carefully to the co-operation of many different modes of transit and forms of motion through time and/as space. If queer temporality so often suggests a fluid motion across time -- flowing circuits of desire, contact, cross-identification etc. -- what happens if we attend to the profoundly uneven mechanics of motion itself, and reflect more closely upon the participation of co-agents to enable co-mobilities across time and space? If this is all sounding too obscure, let me try to unpack this a bit more: The Richard III discovery -- often sensationalized as a disruptive, "game changing" encounter with the past (A "mind-blowing" discovery! 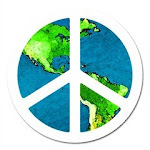 See the video HERE) -- is, in my own mind, enacting a deep distemporality. The translated (transported) decomposing remains of a medieval body found underneath a modern car park -- a collective space for vehicles in transit -- at one grounds an event in stationary space while also evincing the potential of future motion and a manifold history of prior travels: multiple modes of motion in and through one shared space. In other words, the "discovering" (dis-covering) of Richard III's body is simultaneously material and metaphorical (rather than a completely conceptual recovery or uncovering). In another admittedly quite disparate context, Jasbir Puar -- engaging with the temporal "flash points" of Walter Benjamin and Jacques Derrida's time out of joint -- also cites Nilüfer Göle in reference to September 11 as "an exemplary incident which, in one moment, allows different temporalities to emerge, and with them, a range of issues hitherto suppressed" (qtd. 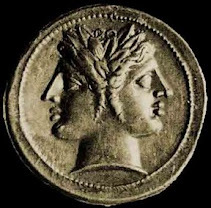 at xvii and xvi). The disinterred medieval body marks a profound disruption, a "history-making" moment that the popular media reports as having the potential to revise broad master narratives: rethinking the shifting perceptions of the monarch over time, both demonizing and apologetic (flip through the gallery HERE); providing an alternate timeline for the Reformation (end of the article HERE); or what you will. On a more immediate level, the fact is that this body's disinterment radically reconfigures social relations and lived space. The dis-covered (revealed, uncovered) body in the car park has cascading effects, obliging drivers and commuters find alternative sites and modes of transit. Richard III now "spills over" into media, online and social (the Richard III Society is going bonkers about this on Facebook, and check out the endless "Richard III parking violation" memes e.g. here and here). 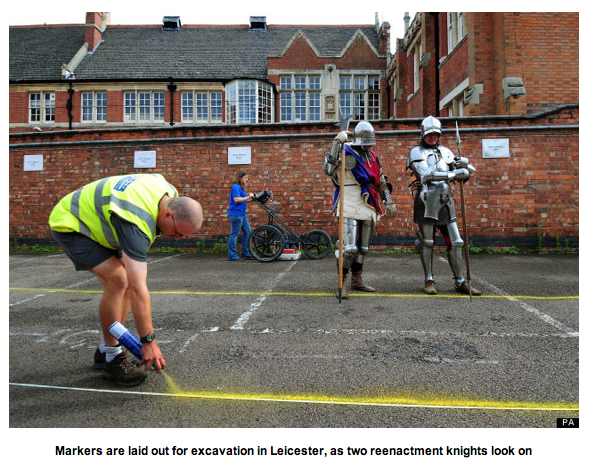 And, on a very material level, the disinterred Richard III physically transforms the local landscape (Leicester is, among other things, building new Richard III attraction across from the car park itself). Perhaps the "discovery" is not so much an uncovering or recovery but rather a strategy of covering-differently. Re-construction of Richard III's face superimposed upon the skull (HERE with gallery HERE) resembles quite a few familiar premodern portraits, yet his features have been strikingly domesticated: he appears attractive, young, and "rehabilitated." It is my impression that media coverage loves "the car park" angle (it always comes up that he was discovered there!) because of the rhetorical and cognitive effect that very site creates: this sense of a collision, explosion, or "clash" between a mundane modern space and an extraordinary medieval body -- and an unexpected sensational contact between times. But it's not that the modern space just gives us new (or renewed) access to the materiality of the past; this dismodern body actively reconfigures modern materiality as well. I've had discussions with medievalists who have said that this whole "Richard III thing" -- especially the whole obsession with the car park discovery, excavation, and transformative sense of history -- resonates with a Middle English text known as St. Erkenwald: in this text, construction work on the "New Werke" in the "metropol" and "mayster-town" of London unearths the tomb of a pagan judge, and much solemnity occurs. Karl (see HERE) has already written in rich and nuanced ways about this poem as a narrative that (among other things) features discovered body from a prior age that radically reconfigures time and community. If I had the time/energy, I would say more about this too -- but in this discussion I'd like to pivot the question of how we move through time to access Richard III himself. As I see the media coverage of this story, I must admit that something that irks me -- identifying as a medievalist here -- and it's the tendency for Richard III to be referenced as one of "Shakespeare's" kings. (You can take practically any article about the Richard III hullaballoo and find it a challenge not find some reference to Shakespeare in it somewhere!) Due the imaginative power the Bard holds in the popular imagination, there's a palpable sense that this late medieval monarch is always/already filtered through an formative early modern representational lens -- and so much of the discussion about accessing the "real" Richard III effectively "digs itself out" from underneath layers and layers of Shakespearean mediation. In all the talk about "rehabilitating" Richard III (with all its uncomfortable implications for his alleged deformity and the social meanings attached to his forms of somatic difference), we can't access a truly "medieval" Richard III -- even if we have the body. Our access to Richard III (always-already) acknowledges -- in dutiful, obligatory, perhaps even perfunctory ways -- the disruptive and intervening presence of the influential Shakespearean manifestation. Some performances of Shakespeare's "Richard III." Only relatively recently has this role been inhabited by disabled actors and/or actors using prosthetic devices. 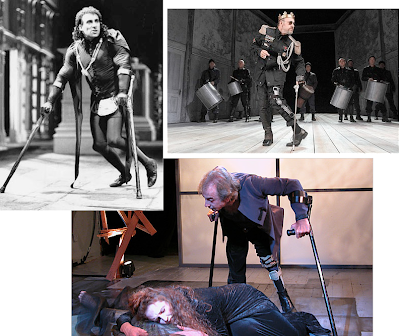 Clockwise from left: Antony Sher (RSC, 1984); Kevin Spacey (Old Vic, London, 2011); Henry Holden (Spoon Theater, New York, 2007). The discovery of Richard III's body and "what it all means" will continue for some time. Just to end, I'd like to briefly consider the implications this has for reorienting how we think about Shakespeare's "Richard III" and its the very material consequences that the king's body might have for disability and performance. Scholarship about Shakespeare's Richard III that engages with disability studies is becoming increasingly common. Katherine Schaap Williams, for instance, offers a very engaging first gambit (available HERE for everyone at Disability Studies Quarterly, an open access journal). She offers astute readings of crucial passages in the play that refer to the maligned king's deformity and remarkable modes of embodiment, all the while, "with deliberate anachronism," adapting Lennard Davis' notion of the "dismodern subject" (which Davis developed within a 19th-century historical context). But to approaching the Shakespearean work as a performative bridge between performance and disability studies, we could say that this play -- no matter who inhabits the role -- will always feature multiple temporalities at play in single body: the present performance, early modern language, medieval king -- and we can pay more attention to how these temporalities collide or co-inhabit shared space. In performance, temporalities move unevenly and via disparate means. In these images above, we gain some hint of how performances can mobilize quirky, discordant assemblages of temporally-marked signs concurrently -- including a conspicuous clash between the use of "period" costume with disruptively anachronistic prosthetics like modern crutches or futuristic technologies. Rather than a queer "touch" across time, the dis-covery of Richard III's body helps us attend to how temporalities move (slide, bounce, connect, and shuffle): we can think about how they not only engage in modes of rearrangement but also jostle together and collaborate in an unpredictable dance. 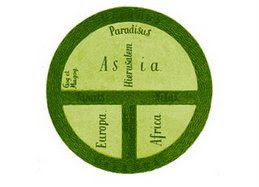 To adapt Puar from a different context, we can think in terms of "spatial, temporal, and corporeal convergences, implosions, and rearrangements" (205), inhabiting a world in which temporalities "interpenetrate, swirl together, and transmit affects and effects to each other" (205). Times, in other words, are anything but static: they enact co-movements that register as awkward, intimate, explosive, beautiful, or all of the above. Rebecca Schneider, Performing Remains: Art and War in Times of Theatrical Reenactment. New York: Routledge, 2011. Jasbir Puar, Terrorist Assemblages: Homonationalism in Queer Times. Durham, NC: Duke University Press, 2007. "A disjointed or disadjusted now, 'out of joint,' a disjointed now that always risks maintaining nothing together in the assured conjunction of some context whose border would still be determinable" (1). Jacques Derrida, Specters of Marx. Trans. Peggy Kamuff. Routledge, 1996 (orig. publ. Spectres de Marx, Editions Gailée, 1993); door hinge reading on p. 20. Katherine Schaap Williams, "Enabling Richard: The Rhetoric of Disability in Richard III." Disability Studies Quarterly 29, 4 (2009); full text HERE. I deliberately adapt the original quotation here. Puar refers to "representational economies, within which bodies [my emphasis] interpenetrate, swirl together, and transmit affects and effects to one another" (205). In reading all the Richard-mania, I've been mulling something that this great post helped solidify: Shakespeare is a car park. The wrenching juxtaposition of unreachable past and "modern" mediation that we find in the car park / 15c monarch binary repeats itself in the Shakespeare's villain / historical rehabilitation pattern in so many of these stories. (Admittedly, not all the stories mention *Daughter of Time*-style rehabilitation of Richard, though some do.) Makes me wonder how many history plays, or other literary representations of historical events, work through this sort of uneasy fit. Even when saturated by Tudor propaganda, like Shakespeare's *Richard III*, plays create strange histories. I also wonder at the contrast you draw, Jonathan, between the two forms of distemporality you observe here: the "whole Leicester car park thing," which serves to reveal a non-static shifting of temporal plates, and the Shakespeare-blanket so many journalists have been throwing over those bones, which worries you. Don't both Shakespeare and the car park accent distemporal fragmentation, the escaping of objects or people or things from historical confines? Maybe I'm constitutionally sympathetic to old Will, & pleased to be teaching his Richard III later this semester, but I wonder how different these two forms of necessary incomprehension really are. @Steve: This is wonderful, so glad to have a Shakespearean perspective here. Love this idea that SHAKESPEARE IS A CAR PARK and you've done an excellent job expressing the two modes/forms of distemporality I have been trying to convey, and how they relate to one another. beautiful piece, JH. Thanks for this. Speaking of Richard III and parking lots...here is Shakespeare in the Parking Lot, a New York theater company whose work I'm embarrassed to say I haven't yet seen. The circumstances of the burial itself have hardly been discussed in all of the flurry this week. Here are some observations at the link above. Now that we accept the claims of the University of Leicester, many myths and accretions of time - anachronisms and rewrites - have been either blown apart or must be revisited. Plainly the king had a disability, which discredits those who want to say that the hunchback was just a piece of Tudor bitchiness. Plainly he was not thrown in the River Soar, as was claimed by many (Protestant Reformers?) during the Dissolution of the Monasteries. As for distemporality, history is a mass of rewrites, even before imagination sets in and starts fictionalising what it cannot prove. I sometimes wonder that we ever get at the truth, or will ever see anything without a reminder of its alternative versions. @Karl: CREEPY COOL (the best kind of cool).